I have long needed a new briefcase. My old, tanned leather case “Brian” (so named because of my incorrigible fetish for alliteration) had put in a good shift, but long shown signs of serious fatigue. A Frenchman by birth, he was no doubt shocked by the appalling English weather. His soft sides were tearing at the seams; his supple and all-too-delicate skin was deteriorating. To look at him had become distressing. Much like a woman ceases to be fulfilled by the gifts of a ‘boy’ and goes off in search of a ‘man’, I realized it was time to invest in a sturdy, bridle leather briefcase. No offence, Brian. The choices for such requirements are, even in London, rather limited. The one name that dominates in this regard is the house of Swaine Adeney Brigg, supplier of fine leather goods and official supplier to the umbrella stands of Clarence House. 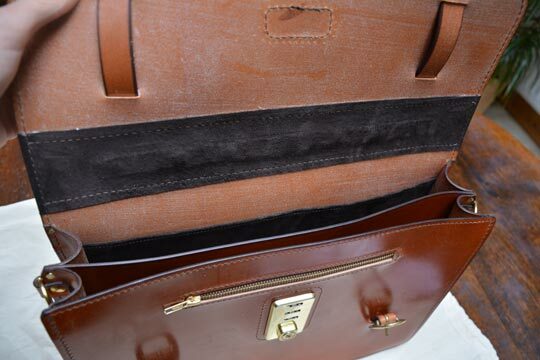 Their briefcases are very handsome and very sturdy – but they are not inexpensive. Of course, they are not cheaply made. And the grade of leather used is of excellent quality. But for a substantial case you are looking at a price point of £1000-£1,500. This is not so bad in the grand scheme of things. Women’s handbags often change hands for double this price using leather of half the quality. And when you look around at the alternatives such as Glenroyal or Marcellino, you would be forgiven for resigning to such an investment. However, I was determined to continue searching. They have a large range of shoulder bags, most of which appear eminently appropriate for the shooting fraternity and, given that it is “heavily oiled and waxed for water resistance and strength”, imply a leather product that is designed to withstand the great outdoors – not just the cloakroom of a cocktail lounge or the backseat of a London taxi. 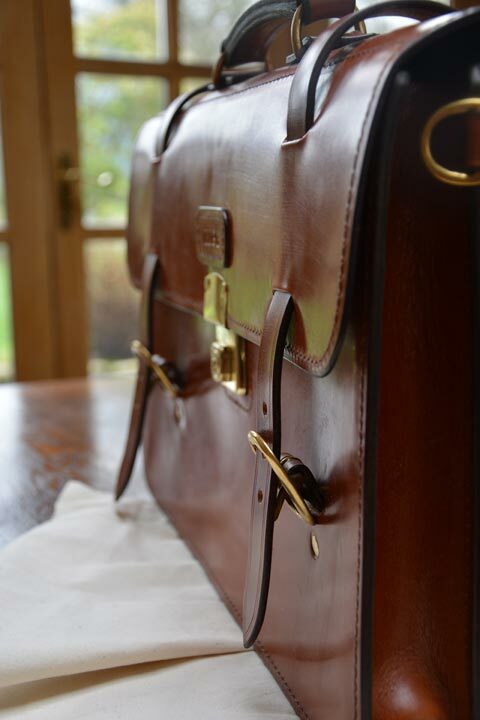 There is a satchel, called the Bristol, and two briefcases: the Salisbury and the Winchester. Both of these are made in traditional English (Devonshire) vegetable tanned bridle leather with pig skin interiors and solid brass fittings and rivets of brass plated steel. I favoured the Winchester for it’s handsome closure straps with brass buckles – a little more interesting and youthful than the Salisbury. The Winchester is also more appealing as it has twin compartments (Salisbury has one). The designs are available in three colours: Black, Havana (a mushroom brown) and Chestnut (a reddish-brown). I have always had brown briefcases. There is a great deal more to a brown case’s patina and character than black, which I find too severe and morbidly Victorian. A bright brown is also more versatile, as it is more adaptable to wear with various suit and shoe colours. Therefore, I made an enquiry about the Chestnut Winchester. Unfortunately, Hrothgar (Roth) had to break it to me that he was phasing out this particular colour as it arrives from the Baker tannery a different tone each time, making it hard to maintain consistency. Instead, he offered me two colours from J&E Sedgwick’s tannery; a dark brown called Conker and and warm, fiery brown called Hazel, of which I chose the latter. 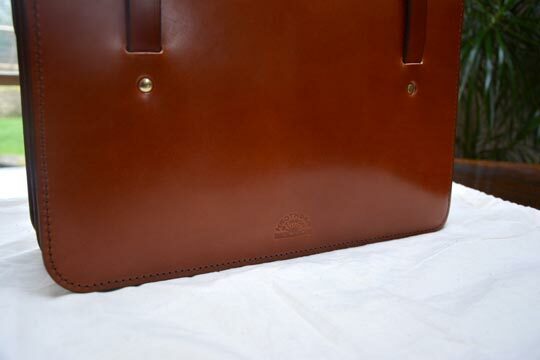 I also asked Roth to put my initials on the front of the case to personalize the commission (all bags are made to order) which required the Hrothgar Stibbon logo to move to the bottom of the back of the briefcase. The result is extremely pleasing. 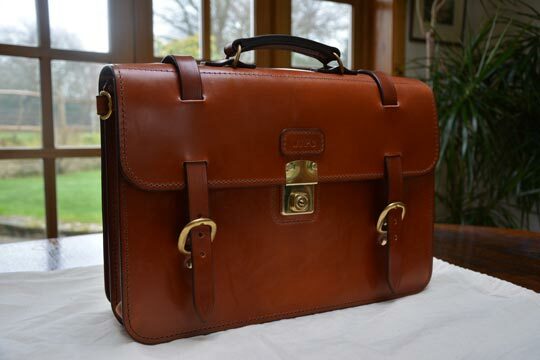 It is one of the finest briefcases I have ever seen. 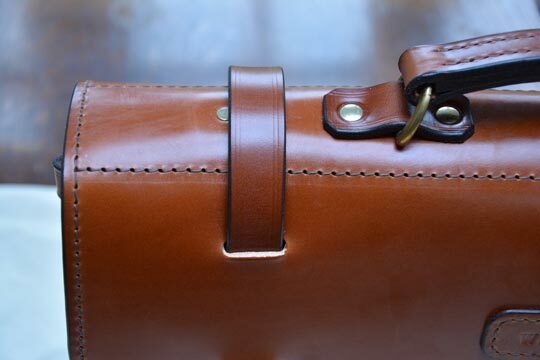 The earthy reek of the tanned leather is intoxicating, the thick bridle handle feels as substantial as a knocker on a castle gate and the brass Cheney lock is of the standard you would expect on models three or four times the price. It is a Rolls Royce of a briefcase, the sort of thing you imagine gleaming in the windows of the emporiums of the grand arcades in Mayfair. There is so much to admire in the craft and simple material beauty of the product. 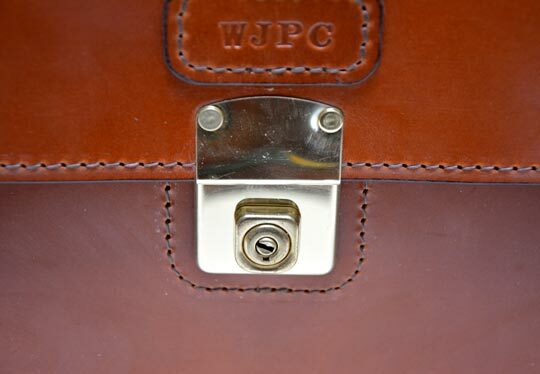 I love the subtle tooling on the tabs keeping the handle attached to the case, the thickness of the canvas strap, the soft pigskin interior, the stitching around the lock and the little lozenge of leather with my initials. The most wonderful thing is that this fine piece of leathercraft, made in England by a master craftsman using his own bare hands (and some hefty tools), is also fair value. The price for this case, without the initials on the front, comes in at a gentle but reassuring £299, which is but a fraction of the cost of some cases made by the more vaunted and celebrated names – but which show little to no superiority in craftsman standards or quality of material. 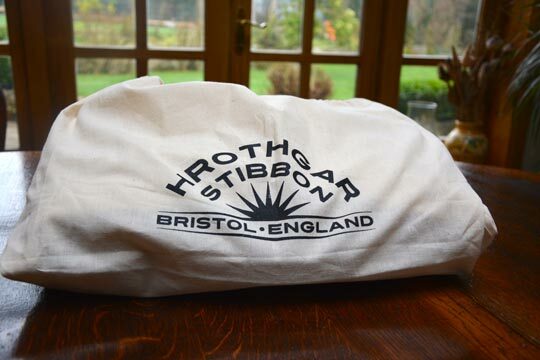 The one downside for potential customers is that Hrothgar Stibbon is an online-only business. This is, admittedly, a double-edged sword; the overheads are minimized which enables the prices to remain highly competitive, but on the other hand, potential customers have no way of seeing (and touching) the product before they buy. Instead they will have to take Roth (and me) at our word. I for one am very glad I took the plunge. I am so pleased to see this article about a master craftsman, from whom I have had various pieces of first-class pieces over the years. My satchel is a central piece that gets me to my various jobs with all books and paperwork needed. 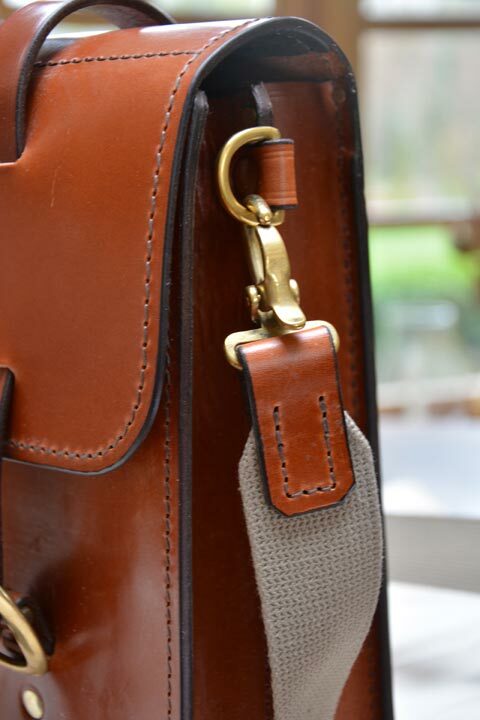 Leather belts, small bags, even customised Lute straps have been made with great enthusiasm and skill, and Hrothgar seems to have no limits in what he will do to personalise exactly to your requirements. Always pleasant, always easygoing, fast and, yes, with silly prizing for his wonderful products. Looking at your photos of the amazing shine of the leather I just realise I must urgently get out Hrothgar’s leather food which came for free with the satchel!